Angela Price, star of W network's Hockey Wives & wife of NHL MVP Carey Price, stars in a creative collaboration with Montreal luxury label YALDA ASHRAFI. 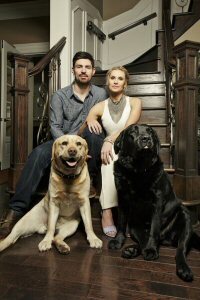 The 70's style editorial shares a rare glimpse of the couple's home and even features an appearance by Carey Price and their famous Labradors. The brand approached Angela to star in this creative collaboration because she embodies the YALDA ASHRAFI woman; strong with an edge. With Angela's growing lifestyle blog "By Angela", her interest in fashion was already established and the opportunity to support a Canadian designer she loved made for the perfect match. By early 2015, Ms. Ashrafi, quietly released her first limited prêt-à-porter collection which has already garnered celebrity fans. She is set to release her follow-up collection in 2016. Angela Price, wearing a YALDA ASHRAFI jumpsuit, accompanied by Carey Price and their two Labradors.